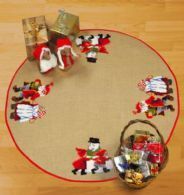 A large and attractive tree skirt with elves dancing around a snowman and a dancing couple. The kit has a large scale black and white chart printed 10 stitches to one inch for each of the repeated patterns showing placement. 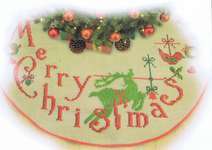 The design uses whole cross stitch and backstitch in 15 shades of wools. The motifs are worked over 75 by 60 stitches and 55 by 55 stitches. chart, needle and instructions for working and completing.